After departing Cozumel, Caroline and I had a very singular goal in mind: escape the tourist zone as fast as possible. So far, our entire Mexico trip had been to areas where most people were either day visitors from passing cruise ships or tenants of nearby megahotels and resorts. We desired to get into the country, into the woods, and to visit places where the animals outnumbered the people. Felipe Carillo Puerto was our first chance to do that. We arrived late in the afternoon, checked into our hotel. The next morning, we woke up early and drove out on the Camino Vigio Chico, one of the most well known birding localities in Quinata Roo. Our first morning of real lowland Mexican birding was amazing. While activity was not super high (as we would soon find out, many resident species were not singing/not very active during the height of the dry season), we still managed to find 50 species of bird. Many of the species were new for both of us, including a cooperative Royal Flycatcher Onychorhynchus coronatus Caroline spotted sitting above the road. While overall activity was low, we were still treated to a host of fantastic neotropical birds, including Squirrel Cuckoo Piaya cayana, Wedge-tailed Sabrewing Campylopterus curvipennis, Collared Aracari Pteroglossus torquatus, and Red-crowned Ant-Tanager Habia rubica. Caroline was even luckier and happened to spot a flyover Pale-billed Woodpecker Campephilus guatemalensis while I was stalking understory birds. From here, we made the long drive south to Campeche, where we spent the next three days exploring the Mayan ruins of the southern jungles and birding as much as we could. Unfortunately, the days we spent in the far south were hot and windy, so activity was lower than we would have expected. Regardless, we still had some amazing sights and some amazing birds. 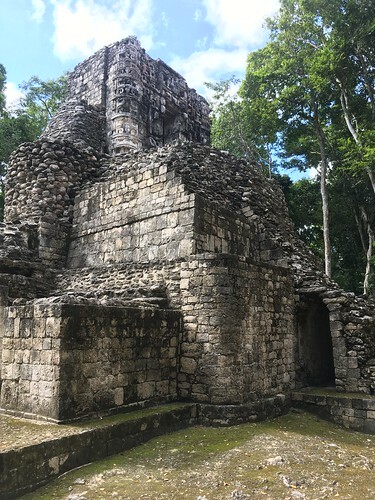 The ruins of Calakmul hosted families of Geoffroy's Spider Monkeys Ateles geoffroyi foraging in the tries and a long javalina lumbered past us in silence. Where we did have birds, we had quality experiences with Lineated Woodpecker Dryocopus lineatus, Eye-ringed Flatbill Rhynchocyclus brevirostris, and even had amazing views of a lone Ivory-billed Woodcreeper Xiphorhynchus flavigaster. In all, our time in southern Mexico passed too quickly, and we are all too eager to be able to spend time there again soon. I woke up early in the pre-dawn. Caroline, tired from our travels from Chicago to Mexico, slept, not wishing to venture out into the low, dry forests of Cozumel to feel the inevitable tropical heat coming later in the day. While I knew the scorching sun was coming, the pre-dawn cool was invigorating. 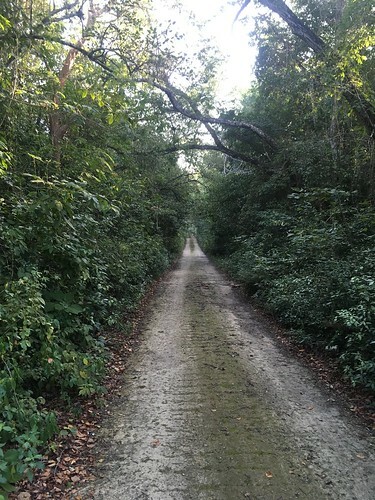 The walk was largely silent, except for a few passing joggers, cars, and a lone Common Pauraque Nyctidromus albicollis singing in the woods near the airport. As the sun rose, I reached a small road cutting through the scrub to the east of the airport. This was my goal: a close, accessible patch of woods from which I could search for Cozumel endemics. As I got my wits about me, Black Catbirds Melapnotila glabrirostris called around me and I luckily had a Cozumel Emerald Chlorostilbon forficatus in an adjacent bush. 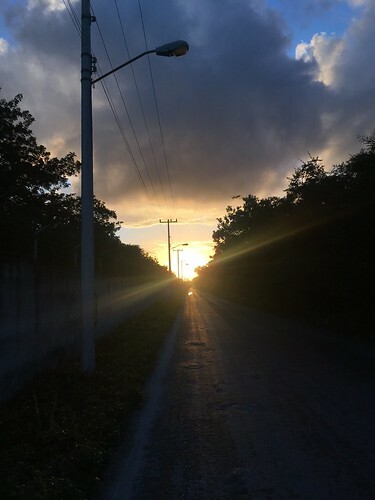 As the sun continued to rise, I slowly worked my way down the surprisingly busy road, searching the bushes and trees for more Cozumel endemics. Migrant warblers flitted between the treetops, and I surprised a close, roadside White-crowned Pigeon Patagioenas leucocephala. It took my a while to sort out the sounds coming from the trees: this was my first morning of birding in Mexico, and many of these birds were either new for me or birds I had not encountered in several years. It immediately became clear that, for one reason or another, many of the birds were not singing: thus, I had to sort through the calls and shadows as I passed the thick scrubby woods. Despite this drawback, I still lucked upon many species I had been seeking on this Caribbean island. While pishing in warblers, a beautiful Cozumel Vireo Vireo bairdi flew in at eye level, furtively assessing whether or not I was a serious concern. a few steps later, I was able to watch another regional endemic - the Yucatan Vireo Vireo magister - foraging in the sunny leaves across the street. Knowing that Caroline had wanted to get an early start out of the tourist zones, I cut back through some secondary scrub towards town hoping for more migrants and more birds foraging in the area. My cutback resulted in more warblers, and produced my only Prairie Warbler Setophaga discolor of the entire trip. Banaquits Coereba flaveola and Blue-gray Gnatcatchers Polioptila caerulea flitted between patches of scrub, and a large group of Black Vultures Coragyps atratus hesitantly moved from their trash pile as I walked past. As I slowly entered the town, I couldn't help but think about coming back to this island one day, and exploring the interior more. But, on our short schedule, we had places further south to go to, and even more to see. As a biologist, few phrases are as exciting as 'old growth forest'. The very phrase brings to mind ancient forests that pre-date the United States, and forests that offer a chance to see what the region was like before the USA's westward expansion. I have been lucky in my life to see several old growth forests, but I find myself constantly seeking the presence of giants. Once, while I was working in Idaho, I stumbled upon a grove of ancient Western Red Cedars Thuja plicata that were in an area inaccessible to loggers. As I walked around their 10+ foot diameter trunks, it seemed that I had entered a land untouched by time. Considering these trees may have been a thousand years old, I wondered just how much the grove had witnessed. I find myself still daydreaming about the idyllic gorge they dominate and what creatures live there now. When I was reading about things in the Chicagoland area, I was immediately intrigued by Warren Woods State Park. Located in nearby Berrien County, Michigan, the park possesses a large climax Beech-Maple Forest. Intrigued by the idea of once again walking among giants, I talked to my friend, Ryan Fuller, about the region, and he decided that an small expedition was warranted. And so, at 8:20 in the morning on 24 September 2016, Ryan and I found ourselves on a shaded road in southwestern Michigan. I was armed with my binoculars and my camera; Ryan with (my wife's) binoculars, his backpack, and his snake stick. We were unfortunately joined by thousands of mosquitoes, but decided that our desire to see the forest was greater than our desire to remain in possession of our blood. 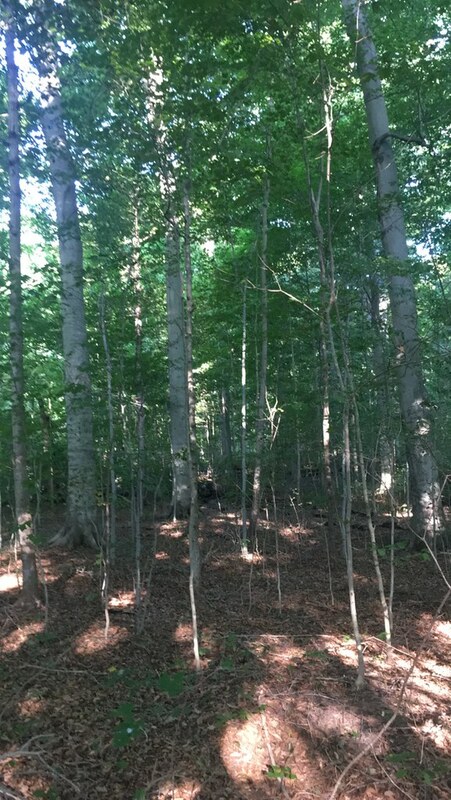 A view of the climax Beech-Maple Forest in Berrien County, Michigan. 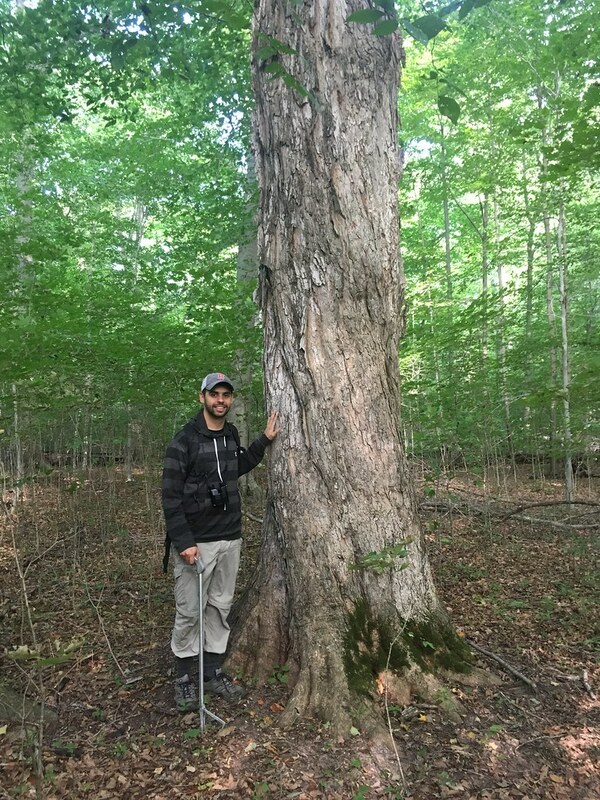 Ryan posing next to a Sugar Maple Acer saccharum. While I followed Black-throated Green Warblers Setophaga virens through the tree crowns, Ryan focused on flipping over logs and working methodically through the underbrush. 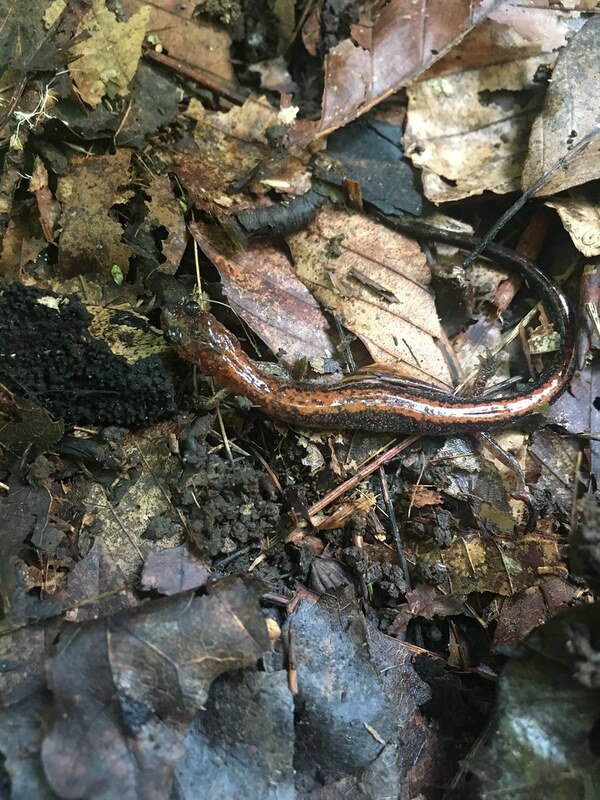 He found several millipedes, beetles, and other invertebrates, but he also found a new creature for us both: multiple Red-backed Salamanders Plethodon cinereus! These lungless amphibians live in forest undergrowth, and were amazing to encounter so close to our new home. One of several Red-backed Salamanders we encountered. As the day progressed, more people (almost all students) appeared in the woods to also enjoy and learn about this fantastic place. We were even able to show one group (from Notre Dame) some of the Red-backed Salamanders living in the forest understorey. We began working our way out of the woods, and lucked upon several more migrants near the parking lot. American Redstart Setophaga ruticilla and Black-and-white Warbler Mniotilta varia foraged in the trees, and we even got brief looks at Wood Thrush Hylocichla mustelina and Grey-cheeked Thrush Catharus minima. Eventually, the mosquitoes succeeded in driving us away from the enchanted forest, but not before we compiled a fantastic fall bird list. After departing the woods, we stopped by Nani's Cafe for some excellent home made root beer and the best hot dog I've ever had, and made our way to a nearby parking lot to catch up on the sleep we had foregone to make the drive to Michigan. After resting a bit, we headed into Warren Dunes State Park, and were treated to even more fantastic Midwestern hardwood forest, including a particularly nice grove of Eastern Hemlock Tsuga canadensis. 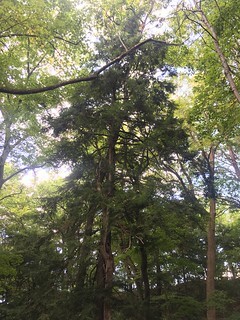 Eastern Hemlock in Berrien County. Eventually, we had to return to Chicago, but our minds remained in Michigan. Our trip to Michigan provided us with a chance to relax, but it also had the opposite effect: it had re-energized us, and made us even more determined to promote the conservation and education of the systems we will study during our PhD's at the University of Chicago. It's going to be a great six years. My name is Jacob C. Cooper and I am a birder/ornithologist currently attending the University of Chicago, USA and working in collaboration with The Field Museum. I use most of my free time to look at birds either nearby or afar and to have fun with my friends. I usually spend my summers either birding in the United States or working doing bird surveys. Copyright 2014 by Jacob C. Cooper. Simple theme. Powered by Blogger.